Well, I've gotta say everybody came up with great captions this week which makes it extremely difficult to narrow things down to two runners-up and a winner. But I'll try. 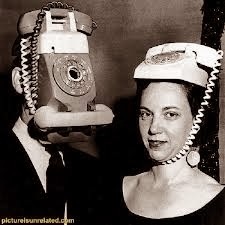 with their latest product launches: the EyePhone and the HeadPhone. No you fools, I said dress up as CONE HEADS! Good one Reffie! Those skits on SNL were hilarious. Guess what? You be hanging with the dufus this week. Congrats again Reffie and thanks to all for playing along. See you all next week! Way to go, Reffie! Enjoy hangin'! Oh yea! 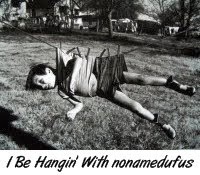 I'm a hangin' and it's not by the neck....or a phone cord. I'm feeling a bit old. Shopping! Yippee! I want one of them new high-tech push button phones! I don't think Reffie's ever been hangin' with the dufus before. Hey, Reffie, congratulations blogger friend unit. Ahahahaha, great captions! Congratulations, Geek Girl! I love all those captions! Congrats to them! We had excellent captions this week. Too bad we limited things to 3. Ahahaha! 'Phoneheads'! I loved the John Belushi and Dan Ackroyd days of SNL! All of those captions are good. If that's the standard of entries, no wonder you had a hard time choosing. I went to high school with Dan Aykroyd. Really. Yep, we had great captions this week. Wow, really?? And was he fun? I really love Dan Aykroyd. I hear he's as smart as a whip, too. Great puns in your caption, LM. Loved it. He was hilarious. Always the class clown. Not sure how well he did academically.